If you have purchased a new phone, here are some few things that you should disable. immediately. Automatic brightness will consume more of your battery. If you turn off the automatic brightness you will be saving your energy consumption. Your screen should not be on for more than a minute. If you regularly use your phone you can change the sleep time. I'm sure in your phone you have more than one app that you never use. The app maybe from Google or a pre installed app. It's advisable if you delete these apps. Some apps that can't be deleted can be disabled. You can go to settings ->Apps, then select the app that you want to disable or delete. If your phone is slow there are somethings that you can do. Disable all transitions. You can do these by enabling developer option. In the developer option reduce the transition and animation speed to 0.5 or just deactivate it. Vibrations are usually very irritating. This feature is never really helpful. Just deactivate this feature. You can go to settings then select sound and notifications. Disable any vibration option that you do not need. 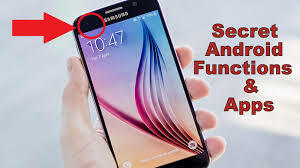 You can disable charging tones, keypad tones, unlock screen tones and any other sound that you do not need. Google normally uses your data so as to send ads to you. Different apps will display different ads based on what your data. You can disable this option by going to Settings and search in the Google menu. You will then find ‘Ads’. From here you can select which apps that you want to receive custom ads from. There are some secret Android functions that you may not be aware of. Here are some of these features. If you have an Android device you listen to this article instead of reading it. All you have to do is go to Settings -> Accessibility and turn on the Text-to-Speech Output option. If you want to locate your android device just go to Settings -> Security -> Device administrators, and check the boxes next to Android Device Manager. By doing this you can locate your phone when it's lost and wipe off any data on your phone. You can switch on guest mode when you want to give your phone to someone else. He or she will not be able to access your private data. With guest mode you give the new user limited access to your phone. If you have poor eyesight you can magnify your screen. Just go to Settings -> Accessibility -> Magnification gestures. With this feature you can double tap any part of the screen and you will be able to zoom that part. For hotspot mode you can set it up by going to Settings -> Tethering and portable. From here you can set up your hotspot and tether it to any other phone. In situations whereby your hands are occupied you can use your head to control your phone. An app called EVA Facial Mouse helps you do this. There is a secret game on your Android device. First, go to Settings and select About phone or About tablet. Tap the android version several times. A mini game will appear and you can pass time playing it.